Don't wait another day. If you put it off another day, you might not get it done. This is the time of year to get your own supply of wallet calendars. 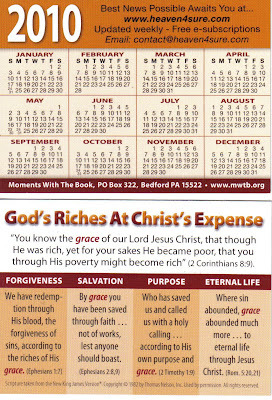 Yes, for around $39 you can get your own personalized wallet calendars for 2011. You can have your own name on it, your contact information or your favorite verse. Here is a sample from last year - just to give you an idea of what you can do. You could use them for your Christmas cards, tips or whatever. Leave them on the table when you leave Starbucks, Tim Horton's, Duncan Donuts or your favorite coffee shop. Pass it to a cashier. You could use your own personal contact information - or you could have the contact information of the local assembly on it. The point is - for $40 you can have 500 of these personalized calendars. For $60 you can have 1000 personalized calendars. Something else you can try once you have the calendars - modify a little envelope (copy and tape it together) so it neatly contains 50 calendars. Print on it: Take a Calendar. Then take a tack and go to your local store or post office and tack it up on the community bulletin board. People will take the calendars. 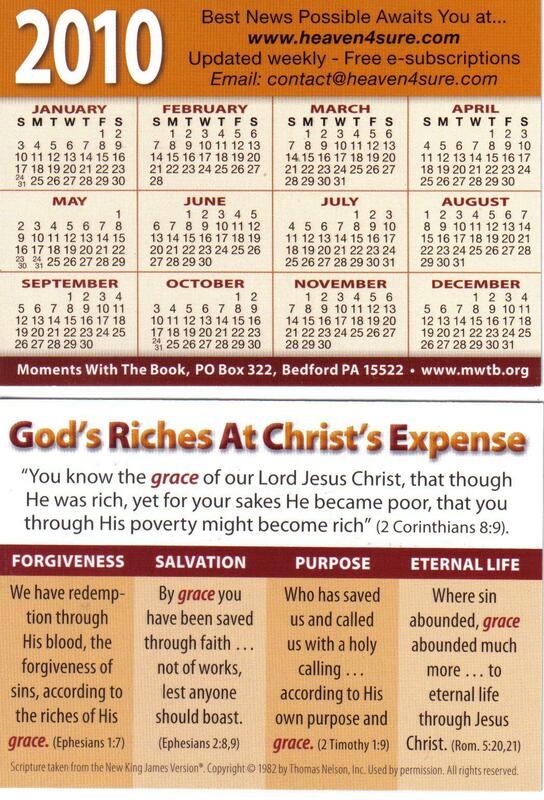 If you want to leave a comment on other ways to distribute these personalized pocket calendars - go ahead.